It’s a hassle. It’s bad timing. It’s even frustrating at times. But when it’s all said and done, it’s always worth it in the end. You know what I mean? The big projects, the big performances, the big events that you might do year after year. When you are in the thick of it, you may wonder, “Why am I doing this?” However, after it’s done, you realize why. 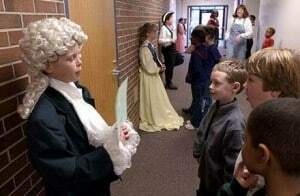 That was my experience last night at our school’s Wax Museum. It was a lot of work and a lot of prodding, a lot of running around and extra time taken out of our normal routine. But then the evening performance came and there stood nearly 100 students frozen in the pose of a famous figure in history. And as parents and families walked through the halls of the museum-school pressing buttons, each one came alive and recited their own speech telling about their life and accomplishments. I often write about process, exclaiming that IT is what is truly important in learning, and it IS. However, in this case, I almost feel like the final product really overshadows the process. Maybe it’s the smiles on the kids faces when they realize they can do something really great – stand in front of groups of people and deliver a speech – in character, in costume and by memory. Maybe it’s the parents’ gratitude for providing such an amazing event for their child to work hard and shine. Maybe it’s knowing that it is these types of projects and performances that allow others to see the students in a new light, proving that learning is much more than sitting at a desk and taking a test. It’s always nice to think that this huge undertaking has come to an end. (I’ll enjoy cleaning up my room today and asking students to carefully take home their posters.) However, it’s good to remember that it’s THESE types of projects that really bring school alive for students and parents. These are the things that make all the hard work worth it, give students a sense of accomplishment and a source of pride in their work. Ya, it really is worth it in the in end.